I use it for packaging of succulent plants. The color is beautiful and it is fun to use. This review is about item#9570452. I used it to stick the bubble wrap for the cold weather on the outside of the sashes glass, but it was strong in pulling and it was very easy to paste. This review is about item#45255997. Very easy to use, the paste is not too strong, not too weak, the paper is reasonable in thickness, but I want you to be a little cheaper. This review is about item#9570461. It is different from the original use, but it is used in a classic 3D printer. Equivalent or slightly better than 243. Although it is difficult to have paper stuck to the product side due to good stickiness to the modeled object, it can not be helped because it is different from its original use. I tried other things, but there seems to be no substitute for now. This review is about item#45256015. It is used to identify products (work-in-progress) in the factory. Firmly adhered, easy to peel off, no glue remaining. General clerical work, temporary holding of work and assembly, etc. Adhesiveness, suppleness, no adhesive residue, easy to cut by hand, properties of the base etc. are very easy to use and balanced. I am using this only. This review is about item#9570443. Used for office work. The color was also cute mint green. Convenient. Used for headings of files, envelopes, and shelves. It is easy to use. It is convenient to have a holder that is easy to use in office work, even if it is small in width. Cut is troublesome by using scissors to make it beautiful. If it is a tape holder it is unstable when the width is narrow and I do not like jaggies. It is good if there is something that is sputtered. It is used for harvesting agricultural products and recording the weight of cooked foods. It is convenient because it can be filled in with magic and can be peeled off and replaced with other containers and instruments. Since we can continue to write weight sequentially from unpolished rice to going out when weighing ので, we keep track of it on one piece of tape and are saved until the final data management entry. This review is about item#09570477. Even if the price of the famous manufacturer's products is high, there are wonderful things to use as well. There are also big differences from goods of other manufacturers such as good stickiness and adhesion, less adhesive residue, good cutting, etc. It is a product that makes you think that it is impossible to do a good job if you do not do it as much as you have to cost it. Because it uses Japanese paper, it is very strong in tensile strength and tensile adhesive strength, and even when peeled off, adhesive residue is small (almost none), so it is ideal for temporary fixing to prevent the bonded material from shifting or detaching . 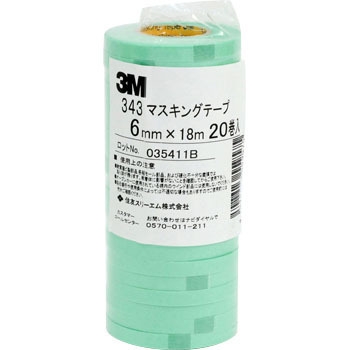 If you use this, you can not use ordinary paper tape. This review is about item#09570443. I want you to handle 60 mm width. Writing a character with magic is very easy to read, it will not get dirty like a cellophane tape even after a long time, and it can be peeled cleanly. This review is about item#09570461.